It is said that birds of a feather flock together. Now, thanks to The Birder, it can also be said that birds of a feather plot revenge together. 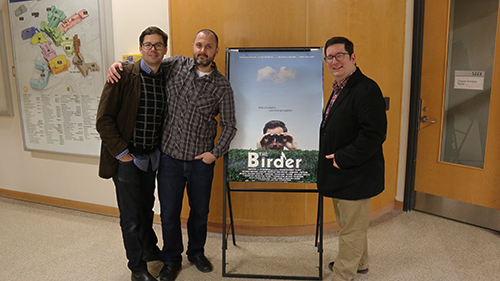 Three years after its release, The Birder was shown to Sheridan faculty and students in a special film screening in the SCAET building on Tuesday, Jan. 26. The film, made by Sheridan alumni Theodore Bezaire, Mike Stasko and Gerry Lattmann, follows bird afficionado and high school teacher Ron Spencer, who forms an unlikely alliance with former student and pothead slacker Ben, in an attempt to remove Floyd Hawkins from his new post as Head of Ornithology at the National Park, so Ron can take his place and restore his bird watching legacy. The film was shown at various festivals from fall of 2013 to the middle of 2014. “We did a theatrical run as well, so we played it in a handful of theatres in Canada, and then in 2015 we did a DVD release in May of 2015,” said Bezaire. At the event it was announced that a deal had been signed with Sony Pictures Home Entertainment, allowing the movie to be released stateside as well. Bezaire felt that directing the film was a huge learning experience for him, dealing with such seasoned veteran actors as Tom Cavanaugh, who portrays Ron Spencer. Alisha Seguire signing people into the screening. Photo by Mark Elgie. “I feel like I had to grow as a director because they were so serious about their craft,” said Bezaire. The Birder marks Bezaire’s second time directing. The first came with the film Things to Do, released in 2005, in which Bezaire enlisted the help of his friends to act. One such friend was Birder co-writer Mike Stasko. 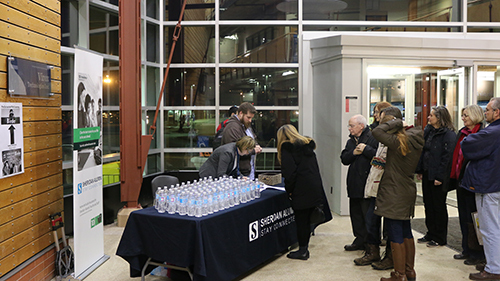 Bezaire and Stasko have seen the film numerous times by the point that it came to be screened at Sheridan. Both are extremely satisfied with the way the film turned out. “I think one of the main goals when we were making this film was to make a film that was a little bit bigger, a little bit better than our previous film, and I think we definitely succeeded on that level,” said Bezaire. “The first few times you screen it in front of an audience and you hear their reaction, a film doesn’t really exist until an audience is reacting to it and laughing at the right parts,” said Stasko. The screening was attended by around 100 people. After the film screening, there was a Q&A panel with Bezaire, Stasko, and Lattmann. The panel moderator, Maureen McKeon, coordinator of Advanced Television and Film, asked why it took so long for the film to be made. Lattmann, the lead producer, told a tale of getting the film’s funding in place, getting casting in order, and getting distribution deals in place. “We had a lot of development to go through first,” said Lattmann. Bezaire had the following advice for aspiring filmmakers. For Stasko, it’s also about saying yes yourself. Added by markelgie on February 2, 2016.